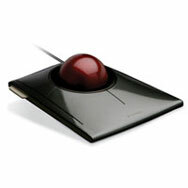 Accessory maker Kensington announced the SlimBlade Trackball Tuesday at Macworld Expo. Designed for control, comfort and ease, the device, which is compatible with the Mac as well as Windows-based PCs, routes all manipulation of digital content through the ball itself. Navigation, media adjustments, document and photo browsing are controlled by rotation of the trackball, with an on-screen user interface indicating which mode or function is enabled. Navigation mode controls the cursor and scrolling; Media mode controls volume, play/pause, stop and next, while View mode zooms in/out and pans for photo editing. The SlimBlade Trackball will cost $130 when it ships at the end of January.